Build an impressive collection of enameled cast iron quickly and easily with the new 5-Piece Signature Set from Le Creuset. The set makes an exceptional gift for newlyweds or anyone outfitting a new home. 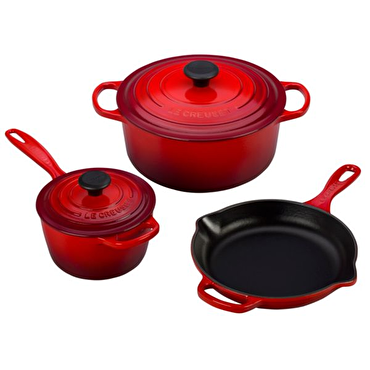 Whether starting from scratch or adding to an existing collection, this set adds versatility to any kitchen and includes a 5 1/2-quart round Dutch oven with lid, 1 3/4-quart Signature saucepan with lid and a 9-inch Signature skillet. The colorful, long-lasting exterior enamel resists chipping and cracking. The sand-colored interior enamel in the round oven and saucepan makes it easy to monitor cooking progress. The skillet's durable black enamel finish requires no seasoning and is designed for higher surface temperature cooking. Large handles provide a sure grip, even with oven mitts. Phenolic knobs withstand temperatures of up to 500 degrees F. The cast iron set is dishwasher-safe. 13 1/2"W x 16 1/2"D x 12 1/2"H.